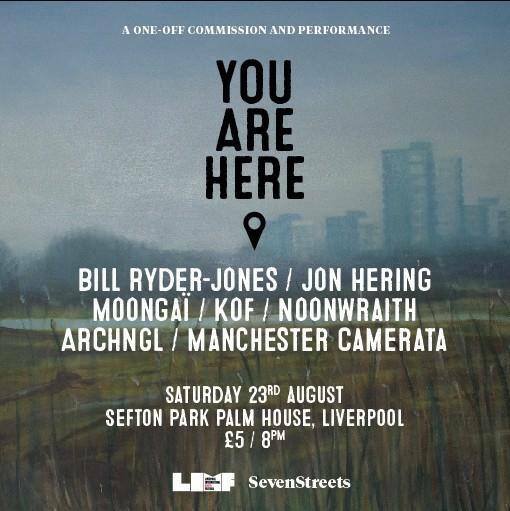 Last night was ‘You Are Here’, the commissioned event that I’ve been working on for so long. It’s probably the biggest thing I’ve done. If I hadn’t been asked to do it by David Lloyd from Sevenstreets, I would never have challenged myself in this way. It was stressful but worth it and I think I’m happy with the work I made, which is a minor miracle. 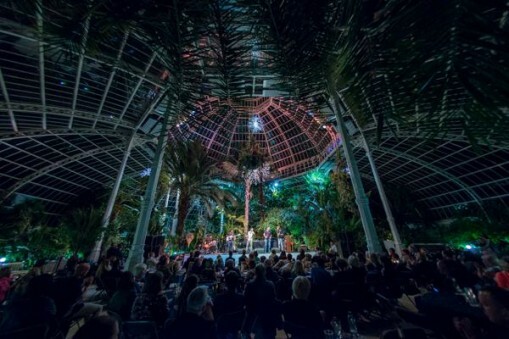 I was involved as the accompanying visual artist, making number of pieces of art, also responding to the theme of home, which were also exhibited in the Palm House last night. I made the artwork that was used for the CD cover and programme as well. I made one long painting, from 8 boards, which attached to the front of the stage. It is a picture of home, on boxing day a few years ago, when it was so cold it looked like snow but actually everything was frozen. 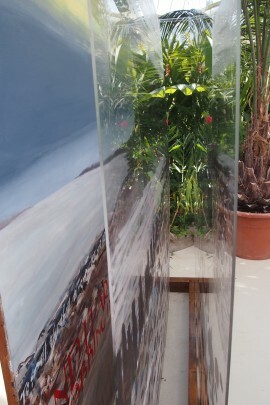 The piece below was made with 3 layers, the front two being made from transparent acrylic which were painted on with oils. 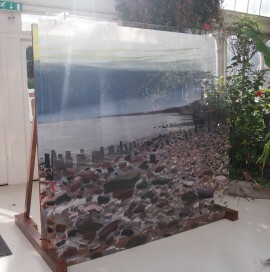 It was a logistical nightmare as it is about 2 metres long by 2 metres high and big sheets of perspex are heavy and bendy. I won’t bore you with the details unless you are interested? Send me an email. Basically I couldn’t work on it in its final frame and I couldn’t move any of the pieces on my own. 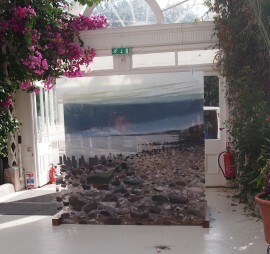 The idea was to create a multi layered painting that is like a dissected landscape. The use of layers attempts to create the illusion of depth. It is interesting painting on plastic, you can make changes by cleaning the paint off fairly easily but it also can damage easily. When I make a painting in normal terms I use layers and bring back the under-painting by applying more layers then cleaning off with cloths. In the same way, when you look at this painting you can see the different layers coming through. 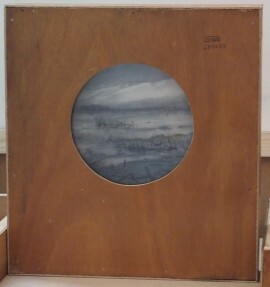 The first layer at the back, which is painted on board, includes words which my Mum, Jane Jenkins, wrote in calligraphy. They come from a WW1 poem by Rupert Brooke called ‘The Old Vicarage, Granchester’. When you view the painting from the front you can only just pick out the lettering and can’t really read the words at all, but you can look down the sides of the painting and see each layer individually. 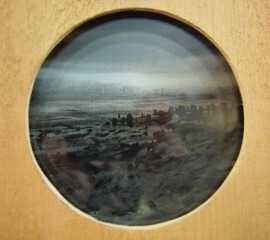 The photograph of the work is so different from seeing it in reality. I think it is a good example of Hockney’s point that the world looks different through a lens. When you photograph something it flattens it out. 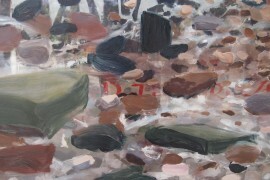 In the photograph of this painting you really can’t see the depth. I might try and tell Hockney about what you can do with perspex. He probably already knows. Below are smaller layered drawings set in boxes. They are hard to photograph. The boxes are made from pitch pine, which used to be used in the back of picture frames. 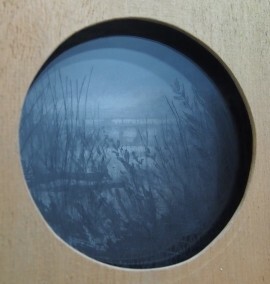 The layers are drawn in pencil, charcoal or ink, or etched and rubbed into with graphite powder. 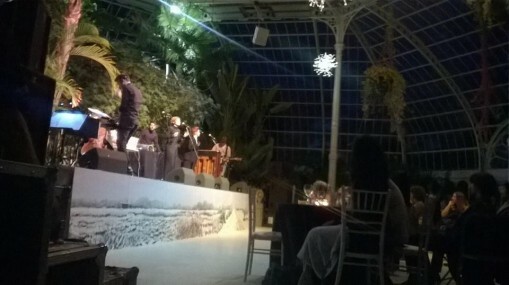 The event itself was magical, the musical commission beautiful and there was a great atmosphere. One of the musicians is Bill Ryder Jones, who I was a big fan of before I was asked to be involved with the project. I suggest you look him up if you like good music. I found the whole experience a bit surreal in the end. I was really lucky to be involved. I am also lucky because all my friends from my studio came to support me and my parents and sister and Andy’s parents came all the way from Hull to help me set up and take everything down, which was a military operation in the few hours we had t do it. I honestly couldn’t have done it without them, I owe them a lot. It has made me think, it must be really hard for artists trying to make challenging work without good friends of family who are able and willing to help. It is a shame that your personal circumstances can have such an impact on the work you are able to make. Probably better that I save this rambling for another blog post. If you’d like a CD of You Are Here let me know.